Foreign leaders including Nicolas Sarkozy, David Cameron and Hillary Clinton are among those present at Vaclav Havel’s funeral. CZECHS AND WORLD LEADERS have paid emotional tribute to Vaclav Havel at a pomp-filled funeral ceremony, ending a week of public grief and nostalgia over the death of the dissident playwright who led the 1989 revolution that toppled four decades of communist rule. Bells tolled from churches while a wailing siren brought the country to a standstill in a minute of silence for the nation’s first democratically-elected president after the non-violent ‘Velvet Revolution’. Havel’s wife Dagmar, family members, friends and leaders from dozens of countries gathered at the towering, gothic St Vitus Cathedral which overlooks the centre of Prague – and just a stone’s throw from his former presidential residence, Prague Castle. US secretary of state Hillary Rodham Clinton, French president Nicolas Sarkozy and Britain’s prime minister David Cameron were among some 1,000 mourners who bowed their heads in front of the coffin draped in the Czech colors. Current Czech president Vaclav Klaus, who was Havel’s political archrival, and two friends — foreign minister Karel Schwarzenberg and former US secretary of state Madeleine Albright — paid tribute to Havel at the cathedral, which had not witnessed a state funeral since 1875. “We will terribly miss him but we will never, ever forget him,” said Albright, who is of Czech origin, in Czech. In a message read at the funeral by the Vatican’s former diplomatic representative in Prague, Pope Benedict XVI praised Havel. Remembering how courageously Mr. Havel defended human rights at a time when these were systematically denied to the people of your country, and paying tribute to his visionary leadership in forging a new democratic polity after the fall of the previous regime, I give thanks to God for the freedom that the people of the Czech Republic now enjoy. At the end of the ceremony, 21 cannon salvos were fired when the Czech national anthem was played. People were applauding when Havel’s coffin was then carried by a military guard of honour through the cathedral’s Golden Gate to Prague’s Strasnice crematorium for a private family funeral. The urn with Havel’s ashes will be buried at his family’s plot at the city’s Vinohrady cemetery alongside his first wife, Olga, who died in 1996. Havel, whose final term in office ended in 2003, died in his sleep on Sunday morning at his weekend home in the north of the country. The 75-year-old former chain-smoker had a history of chronic respiratory problems dating back to his time in prison. Email “Czechs pay tribute as former president Vaclav Havel laid to rest”. 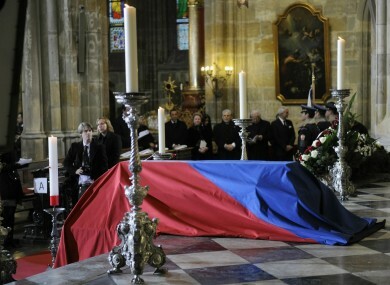 Feedback on “Czechs pay tribute as former president Vaclav Havel laid to rest”.